The white-throated fantail (Rhipidura albicollis) belongs to the family of fantails and silktails, the Rhipiduridae. The white-throated fantail species is distributed in Pakistan, India, Nepal, Bhutan, Bangladesh, southeast Asia and China. 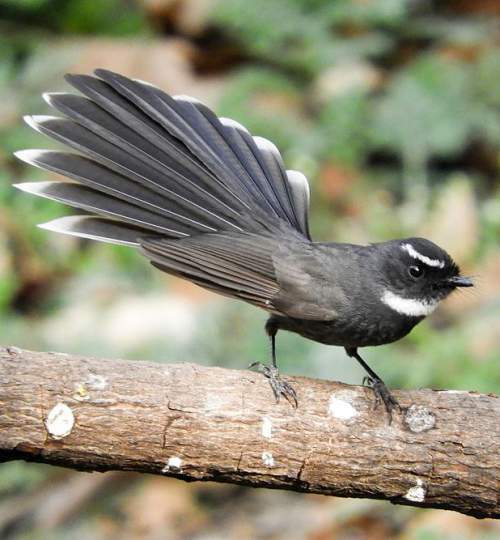 These fantail species have dark fan-shaped tail with whitish edge. These fantails are polytypic species. The white-throated fantail (Rhipidura albicollis) is a small fantail, measuring 17 to 21 cm in length and weighing 9-13 grams. Both males and females look alike. The white-throated fantail has slaty gray upperparts, wings, head and face. The fan-shaped tail is dark slaty with whitish edges. The supercilium is whitish. The throat has whitish half band. The gape is surrounded by two rows of rictal bristles. The bill is short and black in color. The irises are black. The feet are short and gray. The call of these fantail species is a high pitched, whistling, squealing sound. These white-throated fantails are distributed in Pakistan, India, Nepal, Bhutan, Bangladesh, Myanmar, Thailand, Cambodia, Laos, Vietnam, Malaysia, Indonesia and China. 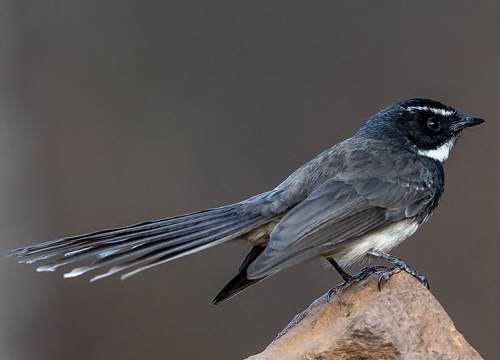 In India, these white-throated fantail species are distributed in the states of Jammu and Kashmir, Himachal Pradesh, Punjab, Haryana, Uttar Pradesh, Uttarakhand, Bihar, Chhattisgarh, Odisha, West Bengal, Assam, Meghalaya, Arunachal Pradesh, Nagaland, Manipur, Tripura and Mizoram. These fantail species have moderate forest dependence. They normally occur in altitudes from 0 to 2500 meters. The artificial ecosystems and habitats of these species include agricultural fields and urban areas. 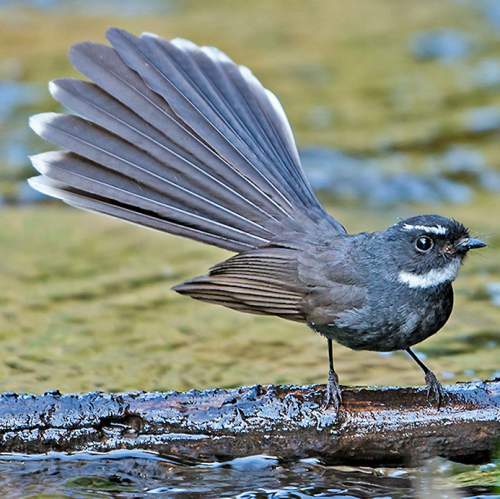 The natural ecosystems and habitats of these fantail species include tropical and subtropical dry forests, broadleaf evergreen forests, tropical and subtropical moist lowland forests and montane forests. The diet of these white-throated fantail species consists mainly of insects. Small flying insects, moths, beetles, flying termites and ants, wasps and bees are their primary food. They hawk flying insects. The breeding season of these white-throated fantails is from March to August in Pakistan and India. The laying season is from February to May in southeast Asia. These fantail species are monogamous. The nesting site is usually a fork or branch of a tree. The nest is a compact cup-like structure made with twigs and rootlets and bound with spiderweb. The clutch normally contains three eggs. Some of these white-throated fantail species are altitudinal migrants. The breeding populations in higher altitudes descent to lower levels during winter. The populations in plains are resident. Post breeding, the juveniles may disperse and establish in new locations within the range. Within their range they may make local movements for feeding and breeding. The global population size of the white-throated fantail (Rhipidura albicollis) has not been quantified. The overall population trend of the species is considered to be stable. In most of its range, this species is reported to be common. The generation length is 4.9 years. Its distribution size is about 11,200,000 sq.km. Habitat alteration and destruction, loss of insect populations due pesticide use, deforestation and trapping for pet-trade are the main threats that are endangering the survival of these species. The white-throated fantail (Rhipidura albicollis) does not approach the thresholds for being Vulnerable, either under the range size criterion, or under the population trend criterion or under the population size criterion. The CITES (Convention on International Trade in Endangered Species of Wild Fauna and Flora) status is ‘Not Evaluated’ for the white-throated fantail (Rhipidura albicollis). The white-throated fantail (Rhipidura albicollis) is closely related to the spot-breasted fantail (Rhipidura albogularis). The species Rhipidura albicollis was earlier considered conspecific with Rhipidura albogularis. The nine recognized white-throated fantail subspecies are: R. a. albicollis, R. a. canescens, R. a. sarawacensis, R. a. kinabalu, R. a. atrata, R. a. cinerascens, R. a. celsa, R. a. stanleyi and R. a. orissae. Current topic in Birds of India: White-throated fantail - Rhipidura albicollis.